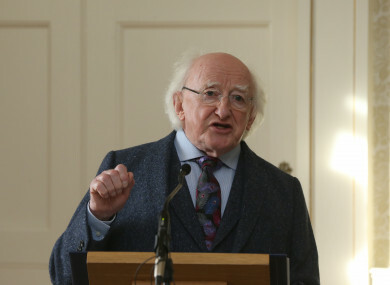 Michael D Higgins at a ceremony at Áras an Uachtaráin on 30 November 2017. PRESIDENT MICHAEL D Higgins has said that he’s concerned about the effect gambling is having on sports people and athletes, and that he’d like to see a ban on gambling ads in sports. Speaking on RTÉ’s Sunday Sport yesterday, Higgins said that he was concerned about some of the cases of gambling among the GAA community and had met people who had suffered because of a gambling addiction. “If I had my way, I wouldn’t have advertising of any access to gambling platforms in sport at all. I really worry when I read the cases,” he said. I think in a way we should protect our sports [by] keeping them free from this kind of stuff. Earlier that same day, businessman Gavin Duffy announced on Twitter that he is seeking a nomination to contest the presidential election. Higgins confirmed that he would like to serve a second term as Uachtarán na hÉireann at the beginning of July. This was despite a previous statement from him that he would only run for one term. Fianna Fáil said it would support Higgins’ bid for the presidency, while Sinn Féin announced that it will put forward a candidate, and would announce who that candidate would be in September. Independent senator Gerard Craughwell has ruled himself out of the race because he can’t afford it; Irish Times columnist Noel Whelan has also ruled himself out. Here’s a more comprehensive analysis of who might run. The presidential election will take place in October. It’s also likely that two referendums on the Constitution will be held during that time as well – one on whether to remove a reference to the woman’s life and duties in the home, and another on removing blasphemy as an offence. Email “Michael D Higgins wants gambling ads banned from sport”. Feedback on “Michael D Higgins wants gambling ads banned from sport”.